This is a tale of heartache, anger, release, and personal growth for me…. This is why I have such a hard time with the topic of Vick and the NFL, even refusing to watch for two years. It’s why I have such a hard time forgiving the franchises that signed him and forgiving the fans that root for him and his teams despite his deeds. Just seeing that Eagles logo (which is everywhere since I’m in the Philadelphia area) would ignite my temper. The worst for me was seeing people who claimed they were huge dog lovers but continued to support the team, even putting Eagles-themed merchandise such as collars and doggie tees on their pets. I’m trying, though, really working to move past the anger and disgust and disbelief I have over the millions he’s been paid since, the status he’s been allowed to re-obtain, and the indifference of the owners and majority of fans. It’s been difficult to comprehend that six points on a billboard sponsored by Coors Light matter more to the majority of sports fans in this area than what’s right. It may always be a struggle for me, but I’m trying. 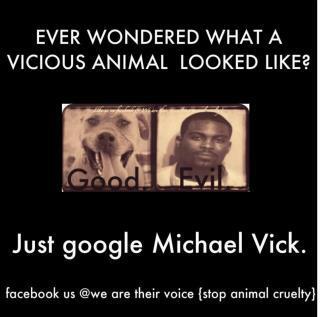 I can’t see ever forgiving Vick, though, for he has never shown himself to be remorseful for his actions. I may never forgive those that gave him the millions, either. But I know that holding the anger I have had toward the fans isn’t hurting them one bit, I’ve just been hurting myself. I will still refuse to support the Eagles, and will not support the Steelers, the team I turned to when the Eagles signed Vick and for whom he now plays. I am now pulling for the success of a third team, one that regularly faces the Eagles, because I value morality over entertainment, period. I know that I am not alone in this, but I also know that I am not able to make those not of my inclinations see it my way, either. If anyone is to ever come to share my values at all, they must come to that realization in their own time. So in the meantime, I will work on letting that anger go. It’s important to note that a story of the NFL paying for injury research performed on animals factored into my decision to no longer watch. This increased the volume of fire generated by my anger. I have to get over the rage from this as well, hoping that change can be made to stop this from happening. There is a petition for exactly that at the end of this post. One thing that has come to my mind recently is that I haven’t refused to take medicines for my health despite knowing they were tested on animals in most cases. Again, I can can only work and hope others join me to stop this. But I know that’s not the case. I know what’s in my heart, and I know how deeply and strongly my convictions run. I know that this is me trying to move past an anger, an obsession even, that has only hurt myself and not the objects of my disdain. It’s therapeutic for me to attempt this. I tried watching a game last year, but once I saw that Eagles logo on the field and the fans in the stands, I had to turn the game off. The rage and disgust started brewing instantly. I don’t know if I’ll ever hold the same love of the game, have the same emotional investment in it that I used to. But I need to write a new page, for my own sake. I have to make peace with the things I cannot change, because I’ve damaged the innermost parts of me by setting emotional fires everywhere I could. My compromise is that I will not purchase anything which feeds the revenue stream of the league. If I choose to replace a hat or t-shirt, etc., I will buy something used or something older off of ebay, which is actually a conscientious thing to do anyway. It’s a form of recycling. As for Vick himself, I can only hope I’m wrong about his apparent lack of humanity, humility, and compassion. And as for those teams by whom he’s been employed since and the fans in question, they don’t want or need my love, nor do they care about my beliefs and principals. I’m going to have to learn to be fine with that. I edited my last post. How so? I changed the link I gave to my anti-Vick page. Why? I changed the NAME of the page. How come? Because the Troll Patrol was let out of their cells early. The page was rocking along, hitting 100 subscribers, and crawling towards 150. Then the assaults started coming. Three people told me they reported the page to FaceCrook. One, and then another, told me they called the police to inform them of my page (again, titled at the time as Mike Vick should be shot, electrocuted, hung, and beaten) and that they thought it was a credible threat upon Vick’s actual person. Of course, those doing the reporting have pictures of themselves in Eagles jerseys and pictures of Vick as the banner photo. Perhaps I bit off too much, perhaps I was trying to be too cute in making my point that these reports usually fail (from reporting the obscene things I listed in my last post). Perhaps it was naive of me to not see more attacks on the page than just reporting to FaceCrook. I certainly didn’t see calls going to the police that I was an actual threat to Vick’s life. Then the subscribers started engaging in verbal warfare with the trolls. I kept asking them to stop retorting, but they wouldn’t listen. I didn’t want to block anyone; just as I believed I was exercising freedom of speech, I wanted to be fair and let the jerks say their piece in opposition to my page. But putting up warnings that the arguing wasn’t going to help our cause wasn’t stopping anything. What could have been 10-comment posts became 96-comment posts. I eventually decided I had to block the assailants. I had to figure out exactly how to do that, since I’d never encountered trolls on my other pages, but then again, those other pages were never provocative. When blocking the comments and those posting them, a feature came up to report abusive comments to FaceCrook. It seems petty to have done so, but I guess fair is fair. They reported me for commenting that I’d like to see Vick come to physical harm (though I didn’t actually say I’D be trying to do it), and I reported them for calling my subscribers fat, ugly, unfit mothers and white-trash (insert nickname for female anatomical part that begins with “C”). I asked the subscribers what they thought of a name change, and I was worried that it was like conceding defeat. But they were very supportive, and even suggested names. After digesting what they offered, and a day to think it over, the page is now Vick-timized: Giving Voice to the Voiceless Ones. I think it’s good timing to change it now, because I have the subscriber base to share and get the page out there now, where the title was what drew the early ones. It’s got the flavor of the original, but not the “Oh, you’re threatening my crybaby dogkiller quarterback vibe”. Now the page’s standards can do it rather than the fireworks display. One woman, who was actually rather sweet, eventually was able to talk to us and not have to be blocked. She said that her sister, an activist, was taking posts from my page and bombarding her with them. So that’s probably how they all found me. My own subscribers might have been hate-bombing Vick fans with my content, which was traceable back to my page. I had to put up another statement that this is not acceptable, and I apologized to the woman for her being accosted that way. It has been crazy. What a night–I had gotten up at 4 a.m. that morning for work, and other than a one-hour nap, I was still up at 5:30 this morning. I got perhaps another hour of sleep then. It’s all so surreal. I wonder what will come of the calls to the police (if, indeed, they were made). 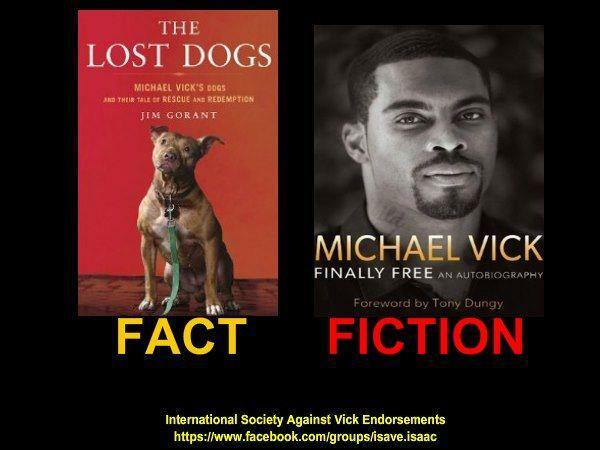 Perhaps the fact that the title is changed and the fact that all the content on the page is about dogfighting awareness, debunking the stereotypes about pit bulls, some non-violent jabs at Vick, and lists of his endorsers to boycott (which seems all legal to me) will save me. I guess, if the police even bother to look into it, they’ll just look at the page and see that. With the name change, they might not even be able to find it at all. I changed the link to it as well. So there we are. Tales of censorship and love (for the cause). 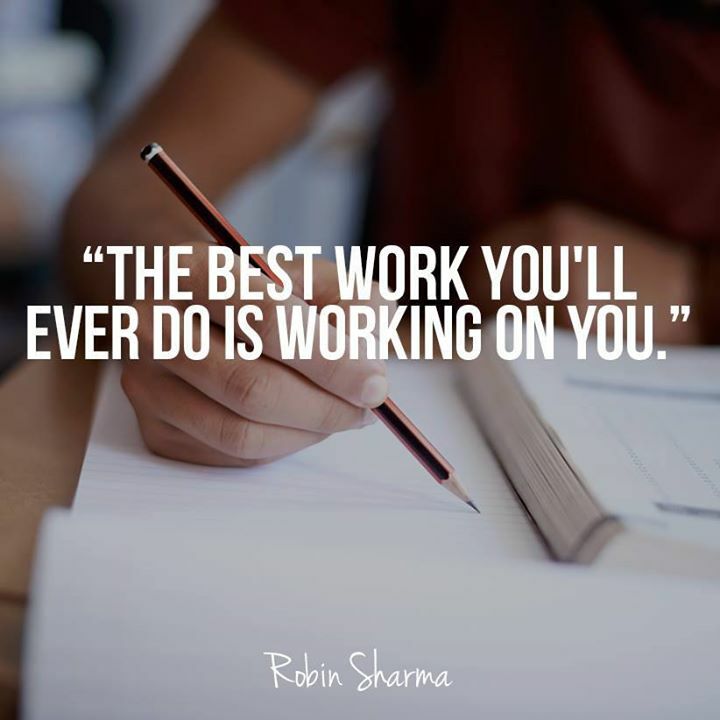 And thus the Beat(ing) Goes On…. Okay, so last time I mentioned my friend Marie’s suggestion that I throw my animal advocacy poems in here. So why not? As I come up with them, I shall do so. On a different topic (slightly), there have always been pages and photos that I and other advocates (of varying causes) have reported to FaceCrook to be removed. Such includes a page called Adalia Must Die, which targets a young girl who appears to have terminal cancer. Targeting those with illness or disability and harmful or hateful speech are both reportable infractions. We’ve also reported pics of people holding up bloody wolf pelts (violence or graphic content), pics of people appearing to strangle puppies by holding them off the ground with hands around the throat (violence, harmful behavior), and pics of cats with guns shoved in their mouth or pointed at their heads (ditto). FaceCrook inevitably sends an email that the pages and photos reported have not been taken down due to “lack of evidence”. Hmmm. This takes me to Monday. I was at work, and it occurred to me that I should create a page with the title “Michael Vick should be shot, electrocuted, hung, and beaten”. Surely this won’t be a violation of FaceCrook conduct policies if those other items weren’t. And these are the exact things Michael Vick did to dogs. He shot them, drowned them, etc., and admitted his joy in doing so. In an interview after being released from prison, reinstated in the NFL, and signed by the Eagles, Vick was asked if he had any regrets or anything he would change in his life. His initial response was “No.” The interviewer asked, incredulously, if he was sure he wouldn’t change ANYTHING. ANYTHING AT ALL. Vick’s response was that perhaps he’d like less jail time than he was given. For the record, he spent 18 months in jail for illegal gambling. Those that like to tell me “he served his time” are errant in that he served the above sentence and NOT ONE SECOND for animal abuse or cruelty. None. So perhaps he needs a little karma to come his way. 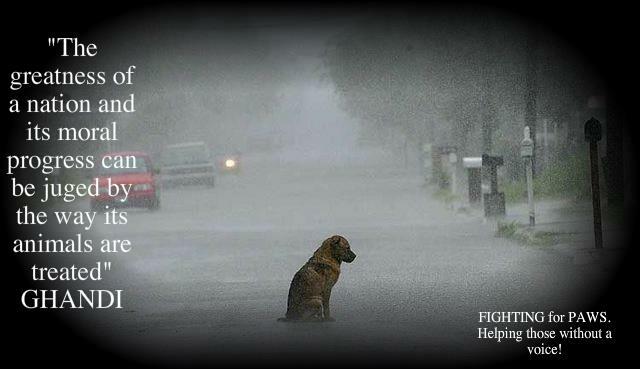 And karma is a….female dog. I did indeed create my page, and I’m already near 50 followers. 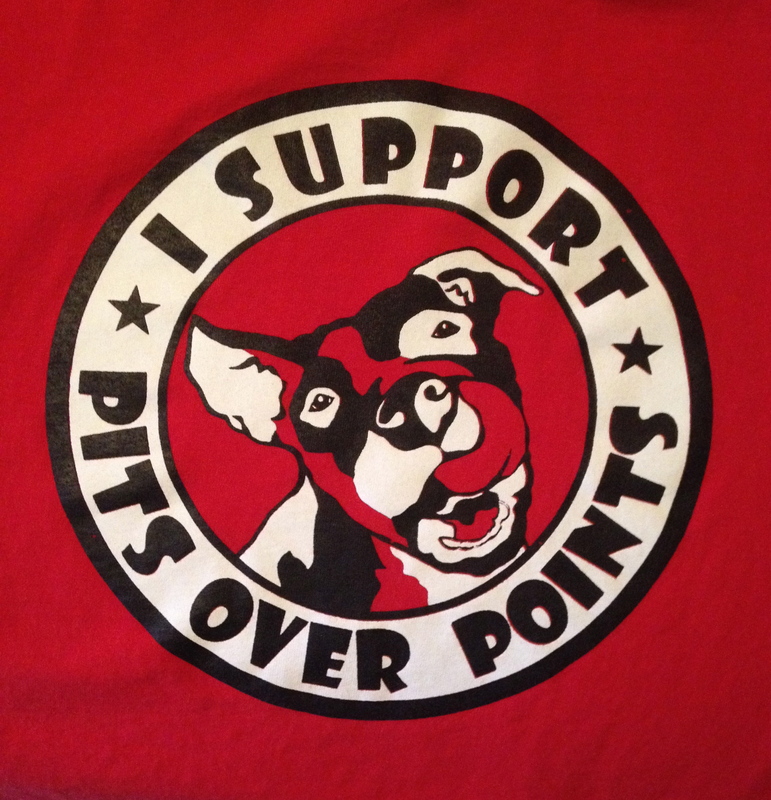 It consists of a lot of the same things that I do on my regular advocacy page (petitions and animal rights issues), but the focus is on dog fighting, Breed Specific Legislation (the boycott of specific breeds such as Pit Bulls in certain cities, airlines, and other places), and promoting better awareness. 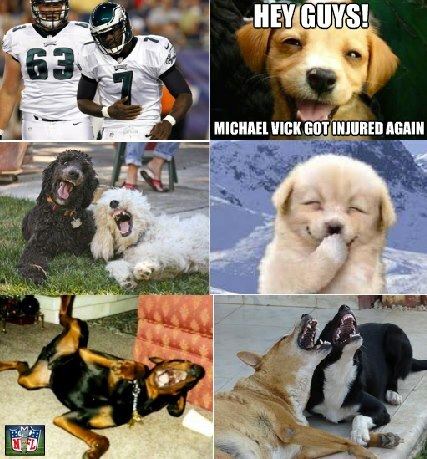 Many folks out there have made pictures of Vick with different humorous phrases on them, and those absolutely go in there when I find them. 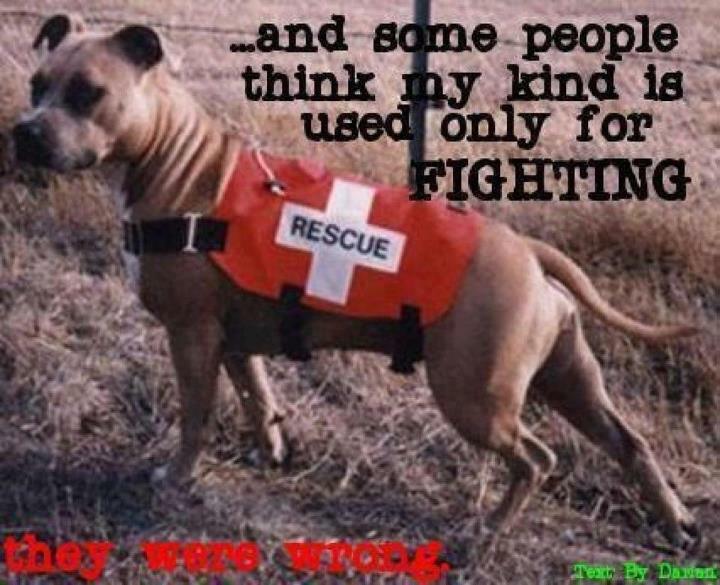 My page link is: Boycott Vick for the Voiceless Ones. Now let’s go full circle to my first paragraph about poems. I wrote 2 for my page, and here they are. The second one references a certain STD Vick is known to have. They were meant to be silly (that’s the story I’m sticking to). I hate all abusers (especially ones with herpes). Let’s set off fireworks in each’s front pocket. They’ll get what’s deserved with their crotches burned and bleeding. 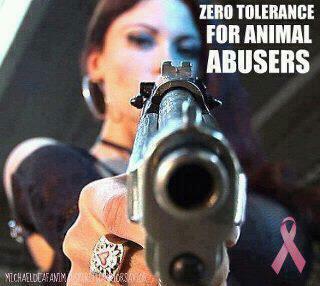 And perhaps they’ll no longer assault defenseless creatures. They went over well with the activists, at least! 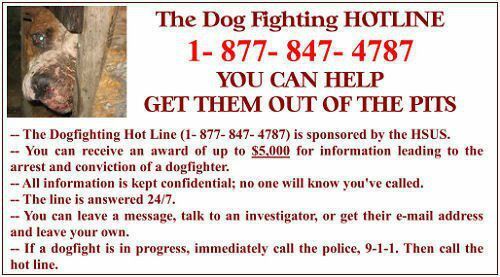 I’ll end with a plug for the book The Lost Dogs by Jim Gorant. This book is written from the accounts of the police officer and FBI officer who ran the bust on Vick’s compound, the animal forensics expert on the case, and the people that rescued the still living dogs. If you don’t understand why we activists won’t let it go, won’t forgive or forget, it is all in the book, the whole ugly truth. Disclaimer: I’m not actually saying anyone should go and confront Vick and mete out their own justice. This is stated in fun and as a way to vent the disgust over Vick’s actions.